Marie France Van Damme, http://www.mariefrancevandamme.com the Hong Kong-based designer known for her globally influenced line of luxury resort, swim, and ready-to-wear, continues to expand her presence worldwide with the opening of the brand’s twelfth boutique in November 2018 in Las Vegas. With boutiques located in some of the world’s most iconic luxury travel and shopping capitals, Marie France Van Damme’s new boutique will be located in Wynn Las Vegas’ Wynn Plaza, the resort’s unique new 70,000-square-foot retail destination located on Las Vegas Boulevard. Situated on the ground floor of Wynn Plaza (3131 S Las Vegas Blvd, Las Vegas, Nevada) the 900 square-foot boutique will offer Marie France Van Damme’s extensive luxury resort, Beach Bridal and ready to wear lines and range of accessories, including evening dresses, resort wear, bathing suits, and caftans. The boutique will offer the best of both worlds: luxe day resort wear and chic evening looks. Marie France Van Damme’s collection of ‘Dolce Vita’ essentials is a return to the glamorous roots of resort wear with a muted palette of silver and gold, hand embroidery and opulent fabrics, from French lace to metallic-toned Italian weaves and featherweight Chinese silks. Signature pieces such as the Boubou caftan provide instant glamour. Collections are not distinguished by season, but relevance. Whether it’s evening wear or day dress, a silk caftan or city pajama or swimwear, Marie France Van Damme’s philosophy remains the same: “What you wear should always give you glamour. Glamour without the fuss and bother,” says Marie France Van Damme. Marie France Van Damme will join Wynn Plaza’s unique collection of luxury boutiques including the newly opened Bottega Veneta boutique, Saint Laurent, and the only permanent Louis Vuitton Men’s store in the country. Distinctive brands that can only be found in Las Vegas at Wynn Plaza include Cipriani, Urth Caffé, SoulCycle, Céline, Balmain, Loewe, James Perse, Cotton Citizen, and Vitra Eyewear, with more to be announced in the coming months. Additional boutiques include Stella McCartney, Kiton, Omega, RIMOWA, Breitling, and Le Labo. 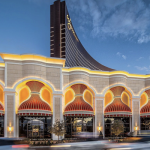 Wynn Plaza will complement the existing luxury retail collection currently at Wynn Las Vegas and Encore which includes Chanel, Louis Vuitton, Dior, Hermes, Cartier, Givenchy, Prada, Rolex, Loro Piana, Moncler, Brunello Cucinelli, Christian Louboutin, Alexander McQueen, Watches of Switzerland, and many more. With two more namesake boutiques planned for Fall 2018, Marie France Van Damme has rapidly expanded since its inception in 2011 to include an impressive range of ready-to-wear, resort wear, swimwear, sunglasses, perfume, and candles. The designer recently launched an eleventh boutique in Miami at Bal Harbour Shops and a store in Marrakech at La Mamounia in January 2018, a Los Angeles boutique in September 2017 at the Peninsula Beverly Hills, a boutique in Bangkok’s luxury shopping and entertainment complex Gaysorn Village in 2017, and her seventh store in December 2016 in Hong Kong’s prestigious Elements shopping mall, which is Marie France Van Damme’s second Hong Kong store. The company opened its very first store in Hong Kong’s acclaimed International Finance Centre (IFC) mall in September 2013. Five years later, Marie France Van Damme has twelve stores worldwide, proving that small curated stores are still very relevant. The company currently has 100 retail locations in some of the world’s most desirable shopping destinations. Made in Hong Kong & South China Marie France Van Damme is proud of the production capabilities it has built for itself in the past 30 years. With couture and tailoring facilities in-house and embroidery produced across the border in China, every production piece is fitted and quality verified to ensure that the Marie France Van Damme label fulfills the highest standards in the industry.